Identification of epitope peptides for 3 Dsg3-specific TCRs and a comparison of the differences in their avidities. (A) TCR-deficient T cell hybridoma was stably transfected by Dsg3H TCR-α and -β chain genes. Successful coexpression of TCR-β chain and CD3 molecules was subsequently detected by flow cytometry. 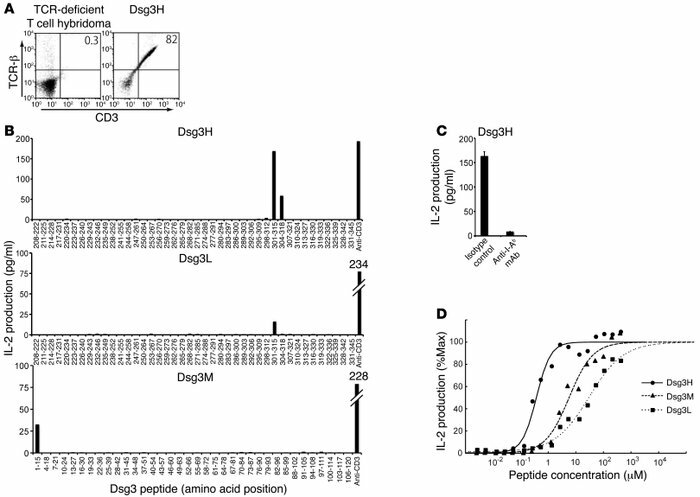 (B) After the Dsg3H, Dsg3L, or Dsg3M hybridoma cell line was cultured with each Dsg3 peptide and irradiated splenocytes or stimulated by anti-CD3 Ab, IL-2 in the supernatant was quantified by ELISA. (C) The Dsg3H-transfectant was stimulated with peptide Dsg3(aa 301–315) in the presence or absence of anti-I-Ab Ab. Then, IL-2 was quantified by ELISA. (D) Dsg3H (line), Dsg3M (thick dotted line), and Dsg3L (fine dotted line) hybridoma cell lines were cultured with various concentrations of the corresponding peptide and irradiated splenocytes and the supernatant was subjected to IL-2 ELISA. Similar results were obtained in 2 separate experiments.